One of the first signs of a cold is cough. And often in the beginning of the disease it is dry, scratching the mucosa, and it causes a lot of pain in a child. But if the first days of the disease to carry out various anti-inflammatory treatments, it is possible not only to mitigate the cough, and faster to cure it. - syrup for cough "doctor mom", "Pertussin", "Travis", "Mucosolvan", "Bromhexine" . During a cold due to inflammation of the Airways interfering with the natural hydration of the mucosa. As a result, it becomes dry, so the cough and causes pain. This process occurs within 2-4 days, until the formation of phlegm. But to accelerate the time and ease the suffering of the child, is better with the appearance of the first symptoms of the disease to conduct intensive treatment. Treatment of cough in children has important differences from treatment in adults, because kids are harder to inhalation or drink healthy drinks. However, the diversity of procedures allows to achieve a positive result in the treatment of colds. For treatment of dry cough in children, use warming up procedures, but provided that body temperature is not increased. Because the child cannot be forced to inhale hot steam from the tea spout, hold the inhalation in another way. Will rascality in the pan with flaky sea salt. Add the pinch of rosemary, sage or chamomile or 1 drop of essential oil of any of these plants. When they begin to exude the fragrance, pour everything in a bowl and bring close to the child to inhale the aroma of medicinal plants. Repeat this process several times a day. If the temperature is not increased, warms the chest of the baby compress and mustard. These procedures contribute to the expansion of blood vessels, improve blood supply, allowing the inflammatory process is faster. To compress, use the normal warm water. Wet in her cloth, slightly wrung out, attach it to the chest, cover it with oilcloth, wool, and wrap a woolen scarf. Leave overnight. To compress can use boiled mashed potatoes hot. Add a few drops of vegetable oil, wrap everything in a thick cloth and apply to chest and he was warm longer, cover it with foil. Mustard put throughout the day. To avoid skin irritation, apply them through the thin fabric. Even so they will show their beneficial properties. For relieving cough let little and often warm drinks: warm milk with mineral water or a pinch of baking soda and honey, just warm mineral water. Let's also teas with lemon, more delicious sweet and sour fruit drinks and compotes. During the treatment of dry cough in children all warming treatments need several times a day, and after they ensure that the baby was in bed. Follow the rules of care for patients: often ventilate the room, do it wet cleaning and maintain humidity hang wet diaper or put a jar of water. These measures are necessary for good ventilation of the lungs and facilitate breathing. At night, when the cough becomes violent and paroxysmal, to suppress it can give the baby syrup, preferably of vegetable origin, for example, "doctor", and when the cough becomes wet - "Pertussin". "Travis", "Mucosolvan", "Bromhexine". They are more suitable for liquefaction and excretion of cough with sputum. The dosage of any of them depends on the age of the child, so before use, carefully read the user manual: review all contraindications and side effects. A large part of the on cough medicines are contraindicated for children under 2 years. A cough can occur for a variety of reasons – colds, allergies, bronchitis, etc. But it often happens that the clot is a very long time and remains dry, causing us trouble, pain and dryness in the throat. When the use of drugs does not work, you can try to cure dry cough folk remedies. If you have enough time on the meds, and the cough persists, you need to stop taking medicines, as they already begin their harmful effects. To dry cough disappeared, it is necessary to translate in the wet, with expectoration. To do this, you need to brew herbal teas and take, alternating breast and urological a day, once a day. Breast collection promotes liquefaction of sputum and urological helps to remove all unnecessary from the body. Every should take 2 tablets of activated charcoal for purification. A complex massage of the back and chest with a Pat promote drainage of the respiratory system and coughing decreases. Very good to massage with honey, then the pores of the skin are cleansed, and the honey draws out all the junk that has accumulated in the body. On the feet are biologically active points, so the massage of the foot on the system su-Jok contributes to more rapid recovery from all diseases. This is good to use a special spiked roller. Good drainage of the bronchi can be achieved if daily 2 times a day for 1-2 minutes to walk on all fours. The bronchi dilate, the expectoration is easier moving away and coughing decreases. Daily intake at night to 1 tablespoon of Cahors with a small amount of honey improves blood circulation, warms the whole body, helps drain bronchial tubes and soothes the nervous system, the cough calms down and disappears. Treatment of dry cough folk remedies quite effective and safe for the body. Using herbs and massage can get rid of the cough in a short time and become a completely healthy person. Cough remedies are divided into three main groups: mucolytics – liquefy phlegm, expectorants — increase the cough and soothing — reduces the activity of the cough. How to cure a cough with folk remedies? Universal remedy is a marshmallow, he has enveloping and soothing effect on the mucous membrane of the bronchi, improves expectoration, reduces irritation. This plant is used both when dry and when moist cough. How to cure dry cough. This cough got its name, because of the lack of sputum. Perhaps for this reason, many adults do not attach much importance to it, letting it take its course. A dry cough can be a symptom of diseases such as bronchitis, tracheitis, bronchial asthma, pharyngitis. laryngitis (in this case, there is still loss of voice). 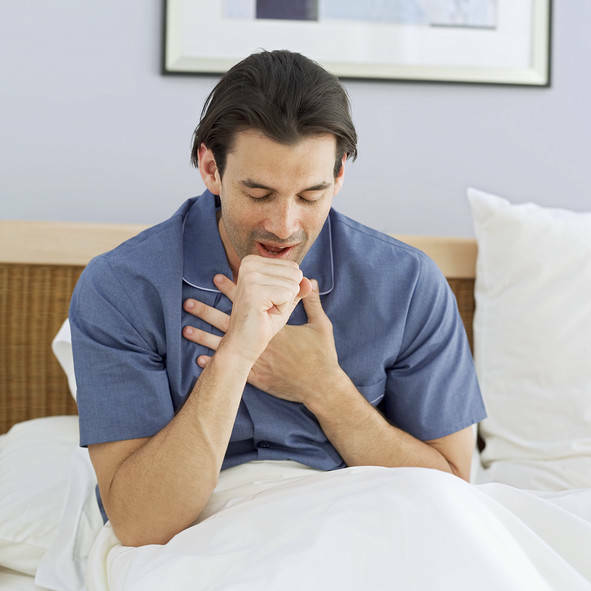 Often the cause of dry cough is the Smoking or inhaling of harmful substances. Getting rid of coughing - a long process, especially if the cough is dry and in the advanced form. Suppression of the cough receptors is not always valid, especially if you don't want to drive the problem inside. But in some cases, to alleviate the suffering of the patient, for example, to promote restful sleep, from acute and painful cough have to get rid of. Since cough is a frequent phenomenon, then literally every house in this case is stored the whole Arsenal of folk remedies. The most common of these are teas with herbs, compresses, rubbing and other warming treatments. So to start, try a warm drink – tea with lemon, honey and ginger root, and also with raspberry or blackcurrant jam, or pureed viburnum, sea buckthorn, with various herbs, the fees of which are sold in all pharmacies. You can also use this pretty commonly used recipe to decrease the cough: a spoonful of honey, a spoonful of butter and half a teaspoon of baking soda, pour hot milk and drink in small SIPS. Well suited to this purpose, milk with goat fat. These tools soften the throat and reduce cough. Don't forget that the right tool, like a black radish with honey. Use different cough drops; it is known to use cough burnt sugar (melt on the spoon with a drop of water to brown, and when the mass has cooled, it is possible to use). When it starts coughing, before eating different sucking tablets or plates, try to breathe deeply and calmly breathing in the fresh air. This, of course, necessary strong-willed effort, but the attack usually goes. Try to use emergency heating procedure, of course, if you have no fever: mustard plasters on the chest or back, dry mustard in socks the bag with warm millet on his chest, capsicum plaster. Poparte feet, put on warm socks and go to bed. Purchase a simple apparatus for inhalation, or at least use a pot, covered with a blanket, to conduct inhalation with eucalyptus, cedar oil. Well inhibit the cough medicines containing codeine. Some of them are sold without prescription. Try them you can, but first, carefully read what is written in the instructions included with these tablets: indications, contraindications, dosages, etc. ; and, secondly, it may be reasonable prior to their use, consult a physician. Dry cough is characteristic of upper respiratory tract such as larynx and trachea. Since in this situation the mucus is produced in extremely small amounts, the body doesn't just get rid of what triggers its development. Do not take cough medicines. The body has caught the pathogen and it must be disposed of to hazardous substances was not included in the blood and caused more damage. Facilitate expectoration of mucus. For this you need to drink expectorant medication, which will contribute to the formation of phlegm and cleanse the body from various bacteria. Make inhalation. You can use baking soda, eucalyptus oil, or just breathe over the steam of boiled potatoes, covered with a blanket. Gargle. This is best done with sea water. It is possible to prepare independently, adding a glass of water a few drops of iodine teaspoon of baking soda and half a teaspoon of salt. Drink herbal teas. They should be soothing and anti-inflammatory action. Particularly effective mint, St. John's wort and oregano. They can be brewed individually or to mix the herbs in equal proportions. Put mustard. Especially useful to put them in the chest to warm and took off the inflammation, and soothed the cough. Drink water. To the cough was mitigated, and in the body produced mucus you should drink sufficient amount of mineral water. Ventilate the room. During his illness, many people try to bundle up warmly and take care to the room was very warm. In fact, it only aggravates the situation. Will correctly open the window and ensure that the room was about +-18 ºc, and the patient well wrapped in a blanket. Place the jar. Cupping massage is very effective in curing cough by stimulating blood circulation and flow it to the affected organ. One procedure is enough. Drink milk with honey. This tried-and-ancient remedy. If you want you can add in the heated milk a little butter, so that it was wrapped around his throat. And honey it is advisable to add a Cup and eat, washed down with milk, since at high temperatures it lost nutrients. Dissolve the candy. Lozenges and cough candies are sold in any drugstore and greatly facilitate the patient's condition.